Fudge always goes down well, whether for school fétes, church bazaars, fund raisers or “just because…”. This was one of those “just because” moments. The freedom of doing something simply because I can and want to is exhilarating and then of course, the simple joy of eating and sharing the fudge afterwards. You need to be quick with this recipe though as the melted chocolate mixture begins to set as soon as it starts to cool and that is as soon as you take it out of the microwave. I’ve made this a few times now, and most recently I experimented a little (also known as just being lazy…) by combining all ingredients into the same bowl and then microwaving it, but save yourself a wasted mission – it doesn’t set afterwards. Somehow, the melting of the butter and chocolate initially, followed by adding the vanilla extract and condensed milk to the already melted chocolate does the trick. I am not scientific enough to explain it to you, but take my word for it. Please. I didn’t do the cooking oil part during one of my experiments but it is better to use it or you run the risk of distorting the beautifully cut squares when you remove them. 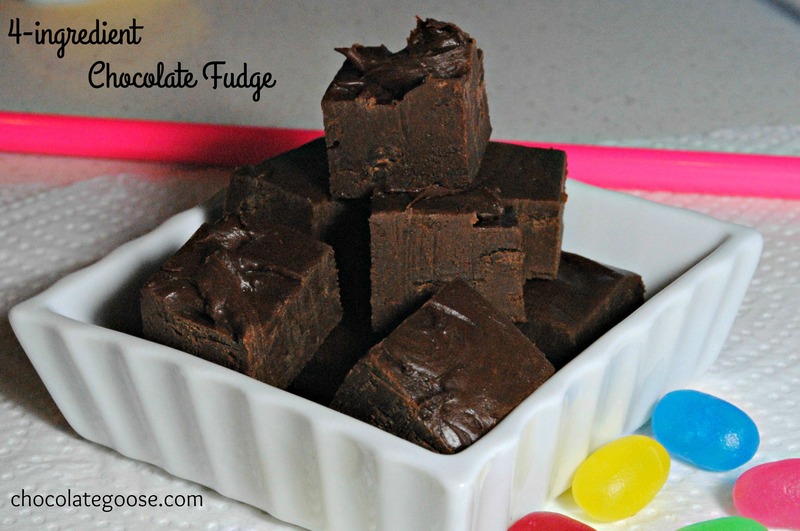 If you’re like me and didn’t want an oily residue on your fudge, simply place the squares onto a piece of kitchen towel directly after slicing them before transferring to a container or serving platter. Line a 20 cm x 20 cm (8 x 8 inch) square baking tin with tin foil or baking parchment and lightly spray with a little cooking oil. Combine chocolate chips and butter in a microwave safe bowl and microwave on High for 1 minute. Allow to rest for a minute then stir. If still a little lumpy, microwave again for 35 – 40 seconds. Stir until smooth. Pour in the condensed milk and vanilla. Combine quickly but carefully so it doesn’t splosh out. When smooth, pour into the prepared baking tray. Place into the fridge for a minimum of two hours to allow it to set before removing and cutting into squares. Store it in an airtight container, but to be honest – it won’t last very long.